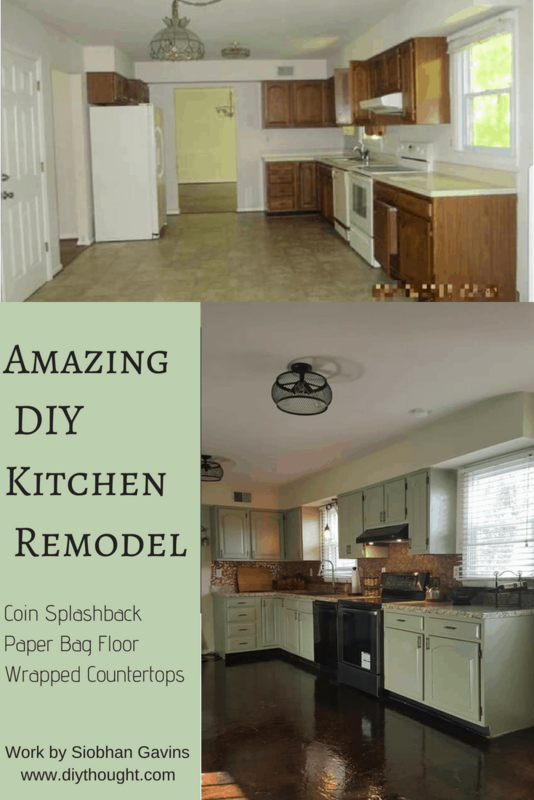 You are at:Home»Home»Amazing Diy Kitchen Remodel For $670! 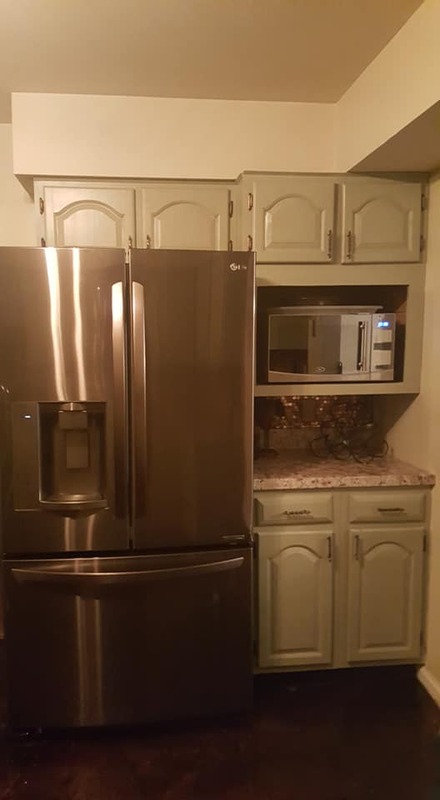 Amazing Diy Kitchen Remodel For $670! 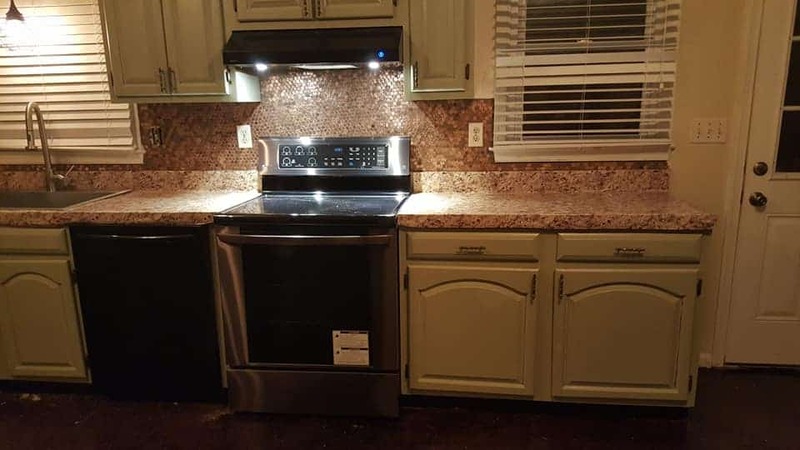 It is possible to do an amazing diy kitchen remodel for $670! 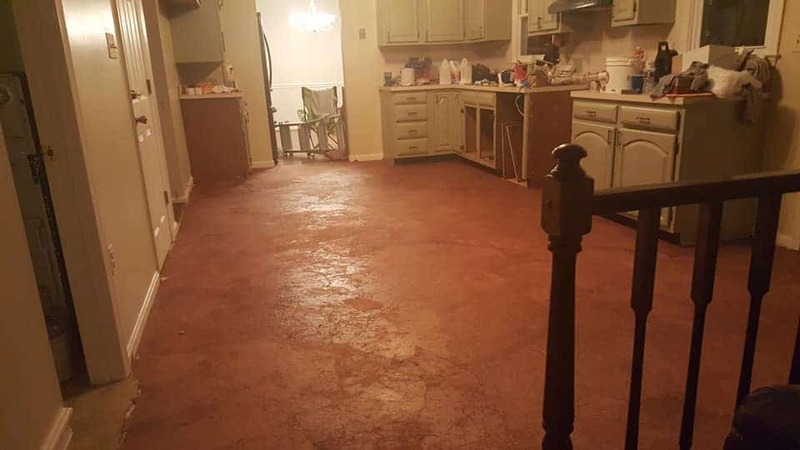 It is hard to believe but the amazingly talented diy expert Siobhan Gavins managed to make such an incredible change for such a small cost. 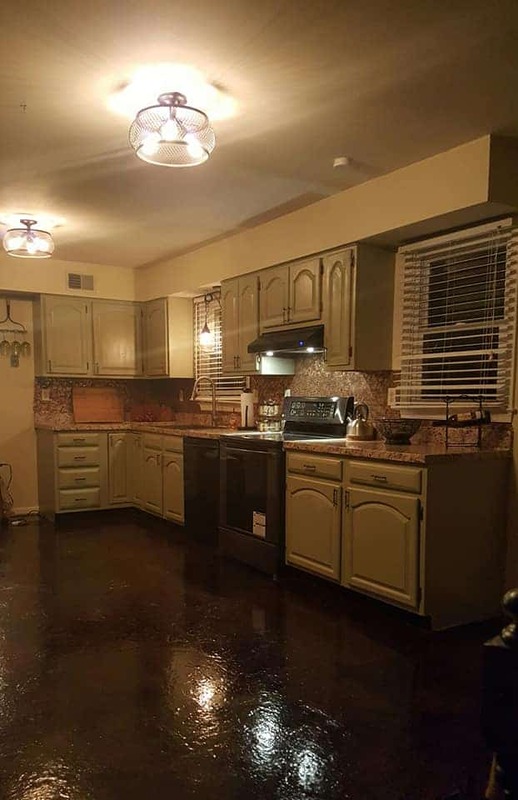 With a coin splashback, wrapped countertops and a paper bag floor she created a stunning and unique kitchen to be proud of. 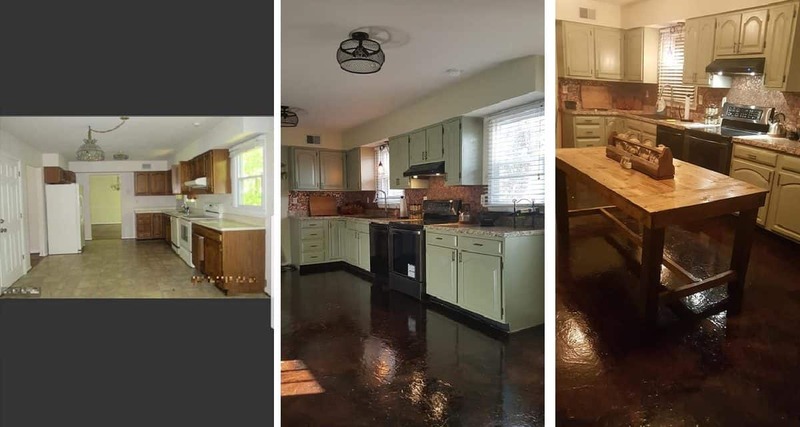 It will take time and LOTS of attention to detail but you can too create an amazing kitchen remodel which looks professional for a fraction of the cost of getting someone in to do it for you! 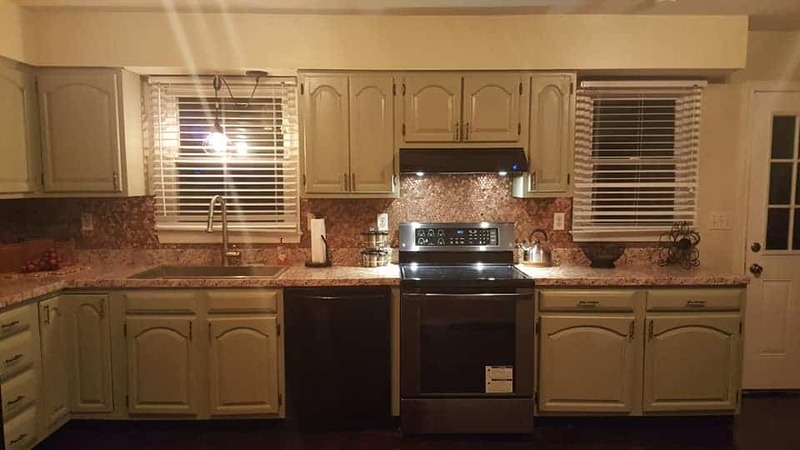 A big thank-you to Siobhan for allowing us to feature your amazing diy kitchen remodel. We hope it will inspire others to complete their own DIY kitchen project! 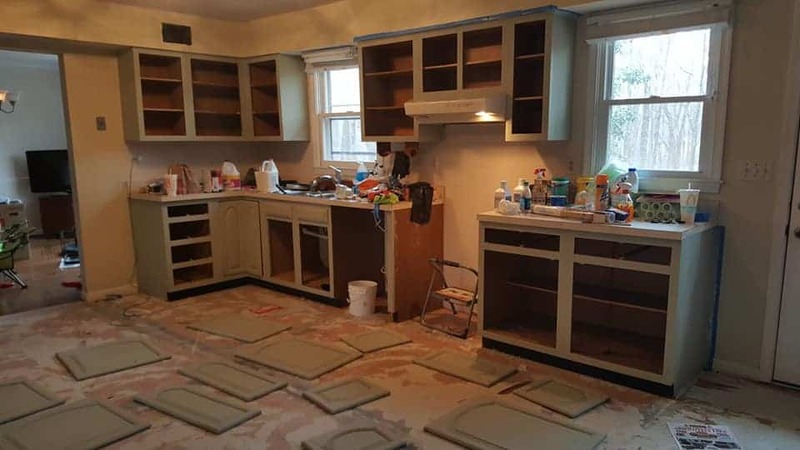 An ordinary kitchen before the remodel. 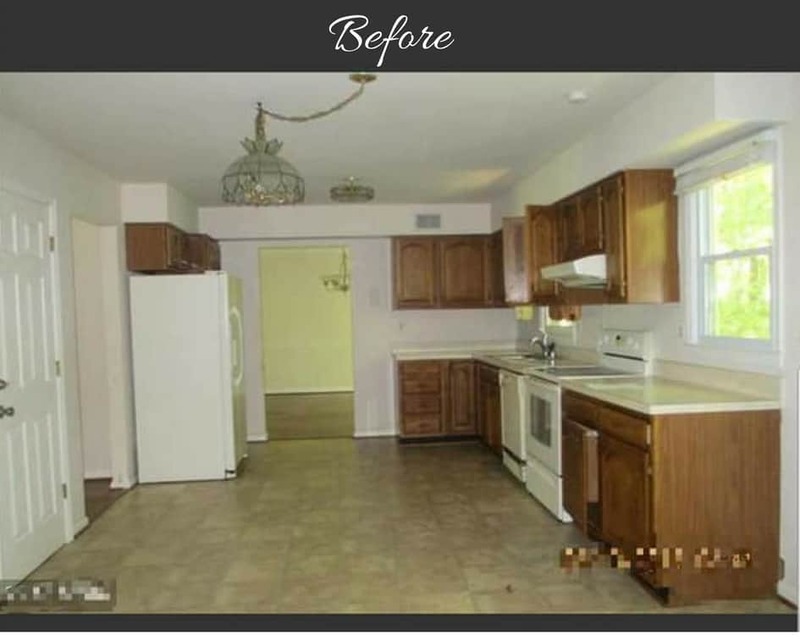 Scroll down to see the after photos and the process to make such a dramatic transformation while keeping costs to a minimum. What an amazing transformation! 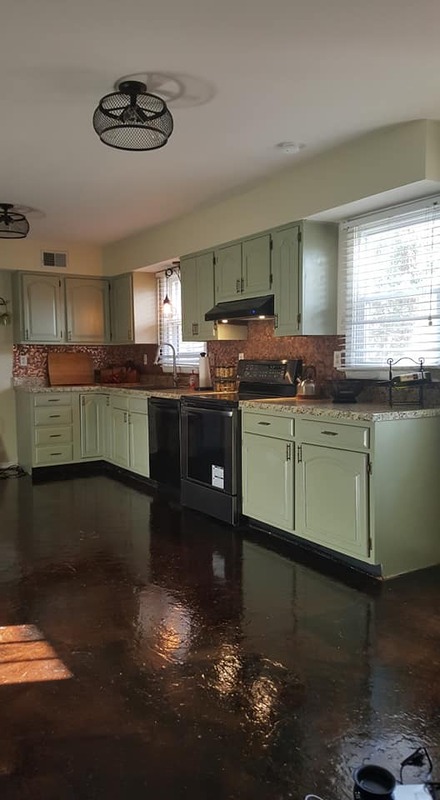 The coin splashback is amazing, as is the color scheme, paper bag floor, and newly covered countertops. Siobhan has a natural talent in not only DIY but decorating. The entire kitchen works well together down to the new light fittings. And check out this incredible farm table! Siobhan built this farm table using this video tutorial. It cost $97 to make and another 40 for the bench. 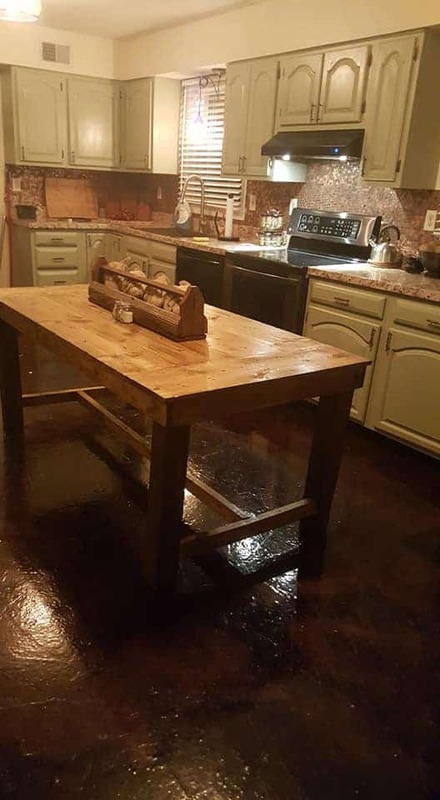 She distressed the wood by beating it up with a hammer and stained it with Minwax honey polyurethane mix. Siobhan says its “Super big, sturdy, heavy and the centerpiece of my eat-in kitchen”. 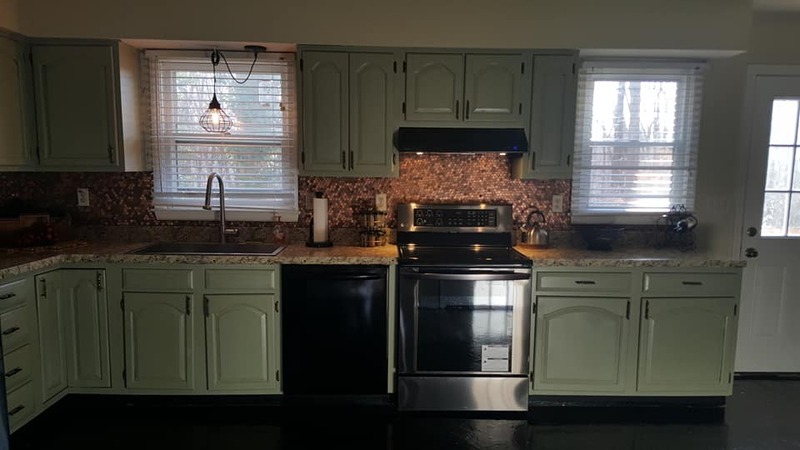 Cabinet doors were removed and painted in sage with Sherwin Williams. The doors were taken off, then clean them with hot water, bleach and dawn. Siobhan then primed, painted and then polyurethaned. Using chalk paint will allow you to skip all of the prepping steps and instead of polyurethane wax would be used. 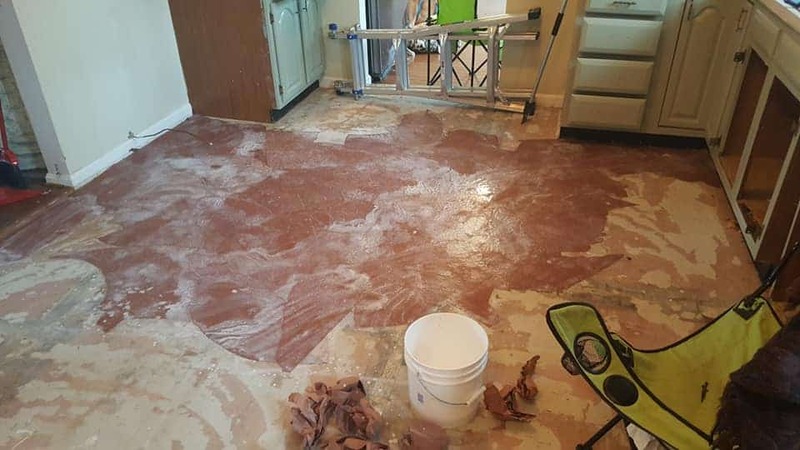 The floor has been covered entirely with paper bags and then sealed. 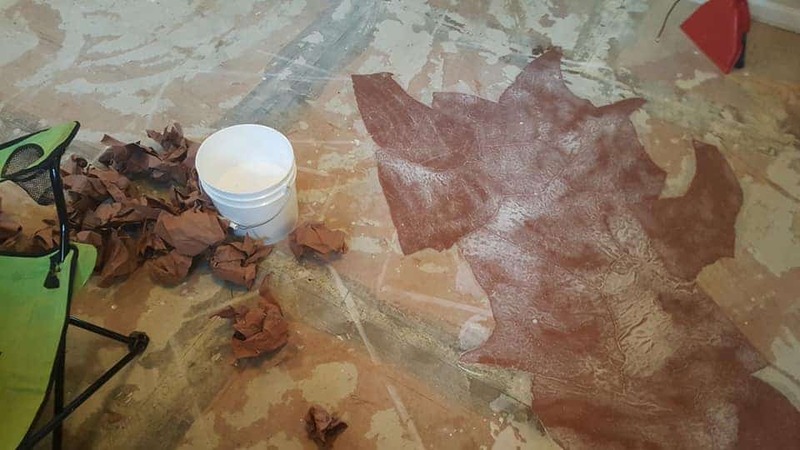 Elmer’s glue and water were used to stick the brown paper bag role from lowes to the floor. Siobhan ripped pieces of the paper bag and balled them up before dipping them in the water and glue solution and sticking them down. 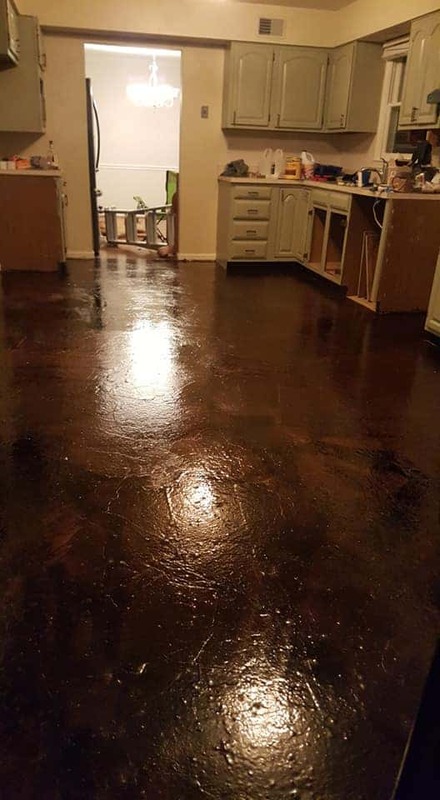 Then she used Jacobean Minwax stain and sealed it with 8 coats (24 hours for each coat) of polyurethane. The results are truly amazing! 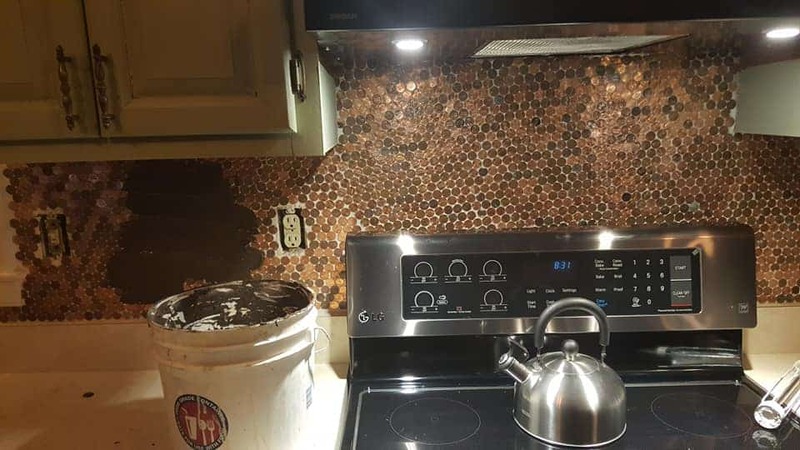 Start saving your pennies to create the coin splashback or do as Siobhan and take a trip to the bank. Siobhan said, “the bank tellers face was utter shock when asked for 50 bucks worth of pennies”! 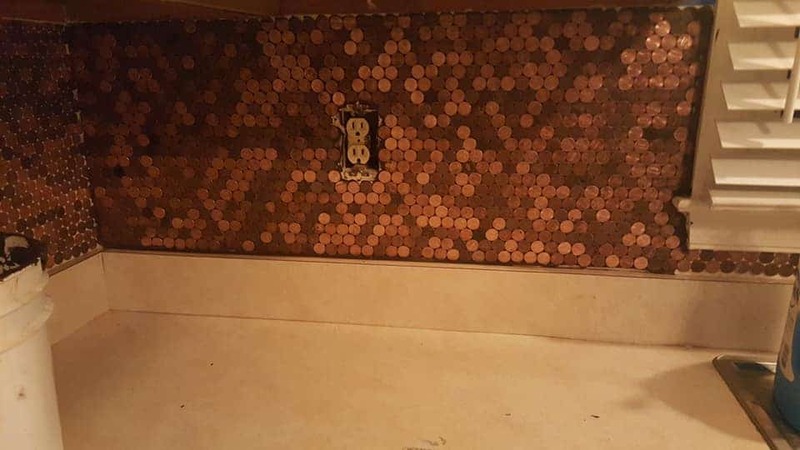 She stuck mastic on the back of each penny, did a groove pattern and then grouted! To do a grove patter you simply put down your 1st row. The next row goes in between the grooves or spaces of the 1st row. This gives a neat fitted look. 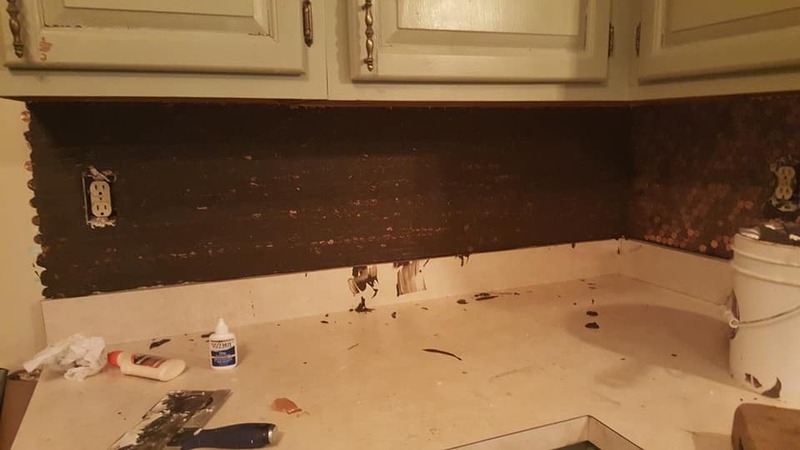 The countertops were wrapped with a faux granite film that was purchased off Amazon. All that was needed was soap water and a blow dryer! The covering is super durable, ideal for a kitchen. 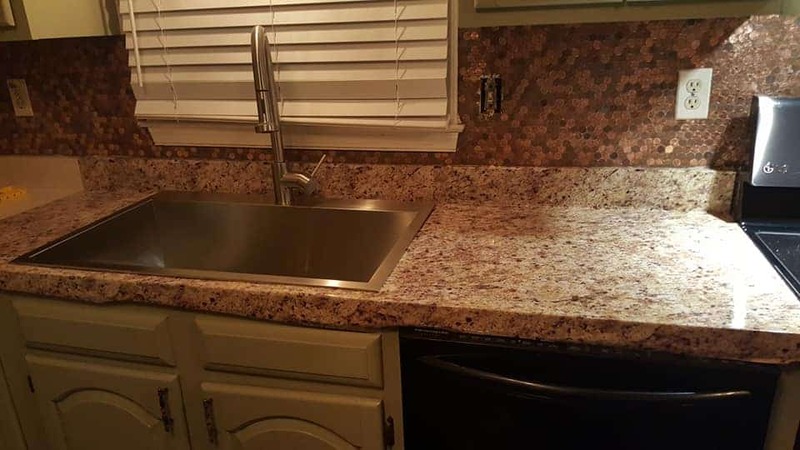 Siobhan spent a little under $100 altogether on the countertops, making it a simple and cost-effective way to update any countertops.